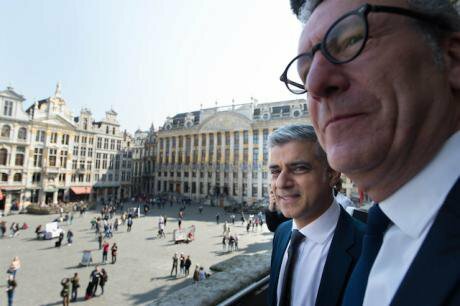 Resigning Mayor of Brussels, Yvan Mayeur, hosting Sadiq Khan at City Hall in the Grand-Place in Brussels in March, 2017. Stefan Rousseau/Press Association. All rights reserved.In recent weeks, Brussels – and Belgian – politics have been shaken by a corruption scandal. In early June, it emerged that the Brussels mayor, Yvan Mayeur, had set up a financial reward system for himself and a close political ally to run for years, through which each of them collected around 112,000 euros for meetings that never took place. The most striking part was that this reward structure was set up within ‘ Samu social’, an agency that takes care of the homeless. In other words: this financial reward system was based on funds destined for the homeless. This was not the first time an event of this kind has occurred: the French-speaking socialist party (PS), all-powerful for decades in French-speaking Belgium and Brussels, allowed a series of such structures to be set up, resulting in a similar range of scandals. Belgium has always had a complicated political structure – six parliaments and governments – in order to balance the power of the various regional and linguistic communities (Dutch- and French-speaking, and a small German-speaking community). Brussels is at the heart of these complexities: it is the only place in Belgium where French- and Dutch-speaking communities live together, governed by a maze of various political institutions. It is ruled by a parliament and government, 19 autonomous borough assemblies, six different police zones and 33 public housing companies. Quite a number of these institutions – such as the 19 borough assemblies within the Brussels capital – are primarily the result of a struggle for power and influence between political actors. Together, the Brussels region has 166 ministers, mayors and city councillors, which is more than Berlin (71) and Paris (42) combined. The underlying raison d’être for this situation is the Belgium ‘pacification’ model, which thrives on consensus between the various cultural and political communities in Belgium. So, why were the above corruption scandals able to happen in this model? Interestingly enough, in explaining the underlying dynamics, it is particularly useful to look at a range of conceptual tools introduced into Africanist literature in the late nineties. More particularly, Patrick Chabal and Jean-Pascal Daloz’s book ‘Africa works’, in which they describe ‘disorder as a political instrument‘. The book, which caused a major stir in African studies, explained how disorder is not to the disadvantage of African political leaders, but actually provides them with a whole range of benefits: it allows them to further entrench their political support networks through the accumulation and redistribution of resources. In this way, disorder ‘works’ for African leaders: these ‘big men’ are able to bind their constituency on the basis of how they redistribute resources to them – a phenomenon which Jean-Francois Bayart in the same period characterised as the ‘politics of the belly’. The book was part of a rather heated debate in academia, the main criticism being the essentialising nature of the book, and its lack of empirically grounded, nuanced understanding. Interestingly enough, greater empirical understanding of these dynamics is not only to be found in sub-Saharan African politics, but also in Brussels: these insights provide an excellent framework for understanding politics in Belgium’s capital. This complexity and fragmentation creates an almost textbook case study of Chabal and Daloz’ politics of disorder. To rule public services in Brussels, a whole range of agencies, non-profits and positions have been created. This structure is very clear for insiders – the political parties in power – as it allows a whole range of positions to be distributed: around 200 agencies with around 1,400 positions, which for outsiders are extremely opaque and difficult to control. This offers a range of political and financial opportunities: it is both an excellent patronage opportunity (i.e. it allows the distribution of jobs for political allies), and a source of self-enrichment. For example, it emerged that the chairperson of the Samusocial (the organisation which supports homeless persons) was allowed a yearly salary of 204,000 euros, a salary almost as high as the Belgian prime minister. Moreover, family members of top officials were given jobs in this organisation. After the eruption of the scandal, a range of other non-profits entered the limelight, with similar dynamics at stake. In other words, this politics of disorder has a clear neopatrimonial system at its heart: power gives access to a range of resources, allowing for a variety of patronage networks to function. As another illustration, mayors’ of the borough assemblies are nicknamed ‘barons’ – the Brussels translation of ‘big men’ – for the way they conduct politics: autonomously on their fiefdom, and to a large extent unresponsively to demands for reform. Again, the patronage system allows them to do so: numerous people profit from this wider patronage system, as they are dependent on these ‘big men’ for a variety of issues, such as access to social housing, or jobs. This fragmentation and complexity means that all political actors are focusing exclusively on their own territory, which is often very small – such as in the case of the barons’ / big men’s 19 borough assemblies. In doing so, more global and widespread problems such as mobility, social housing and security are much more difficult to tackle. This became particularly clear after the terrorist attacks in Paris in November 2015, when the Brussels’ police was internationally criticised for their failure to notice the preparation of these attacks. The division of Brussels into 6 police zones was seen as a major reason for this malfunctioning (something which had been raised before internally ). While the Flemish political parties in the Brussels parliament unanimously proposed unifying the police force (similar to e.g. London), the French-speaking parties unanimously rejected the proposal. The fraction leader of the French-speaking Christian democrats called the proposal an instrumentalisation of the victims of the Paris attacks for communitarian politics. In other words, communitarian identity politics plays an important role in Brussels politics. This phenomenon, referred to in Africa as the ‘retraditionalisation’ of politics (i.e. the re-emergence of ethnic identities in politics), makes any reform very difficult in Brussels. The final remaining question is: what happens with this system, once a ‘big man’ is forced out? As indicated above, the mayor of the city of Brussels had to resign after this scandal. In their ‘politics of disorder’, Chabal and Daloz argue that regime change does not mean a change of system: the new ‘big man’ simply continues to use his power to accumulate wealth and to deliver to his constituents. Also in Brussels, the system seems not to have changed: Brussels’ newly elected mayor – Philip Close – is known as the ‘cumul’ champion in Brussels, i.e. the politician combing the most seats possible in a wide range of public, private and para-public institutions. His other nickname ‘Mr Showbizz’, illustrates how he uses public means to compete in the private market of organising concerts and other cultural events. A judicial body recently judged this as a conflict of interest. Although he announced to let go of some of these positions, it turned out he did not declare all of these posts. Moreover, instead of offering clear apologies to the population for the former mayor’s corruption scandal, much effort was put in honouring his work. At the same time, the new mayor announced to cut 40% of the existing positions and 20% of the various institutions, all of which were sources of patronage. Would it be possible to change both the Big Man, and the system on which it functions?